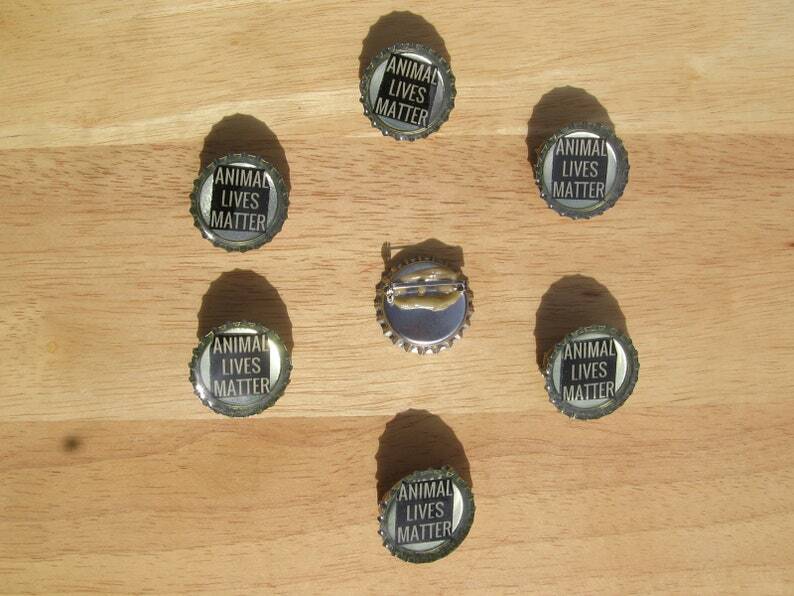 These bottle cap pins were made with Stacie Vegan-Peirce's (Plant-Powered) Vegan Food Fest Fundraiser! in Bushwick, Brooklyn next month that I am planning to vend these necklaces, magnets, key chains and pins at and that all things vegetarian, vegan and beyond movement in mind. These bottle cap, beer cap pendants are covered in epoxy resin and are approximately 1 1/2" in diameter. These Bottle Cap pins are also available as a necklace, magnet or key chain. Necklaces are 24" ball chain or hemp string. Bottle Caps are new, silver, colors or vintage. These handmade pins and beer cap charms make for great art wear jewelry, a great gift or just keep it for yourself. Please specify your design in order. Thanks so much, the order was shipped quickly and received in perfect condition, just a week after shipping. The product was not available,even though it was posted. Great item and the seller also sent a key chain and magnet with the necklace. We accept check, money order and PayPal.